You can changed the hinged doors to sliding doors, add louvre window, skylight, tool holders and the list goes on. Well packaged and arrived with no parts missing. Great customer service by the Cheap Sheds team. It's relatively simple to put the shed together. However instructions could be beefed up a little. Especially around putting the doors up. Over all it looks awesome once it's up and running. During my purchasing and installation period, the help I've got from the staffs were very good and I am pleased that I have chose your product. There was some confusion with the details which should be sort out when ordering. Transport was bit slow. Hello Bev. 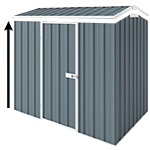 The colour steel Durabuilt EasySHEDs are all designed with Off White trims. Any colurs you choose will have white trims around the panels to give a nice frame for the colour panels. I hope it helps and please let us know if you have any other questions. Hello, The sizes we have for our sheds are outside measurements.